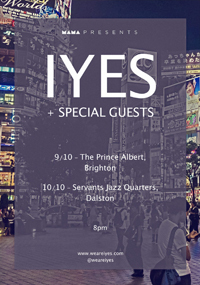 It’s that time of week again where wish dish out our recommendations for the best Brighton bands playing around town this weekend. You might not be at Glastonbury, but that’s no reason to miss out on live music. 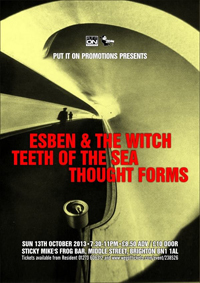 Our picks for Friday night are the Les Enfants Terribles and Brighton Rocks nights. 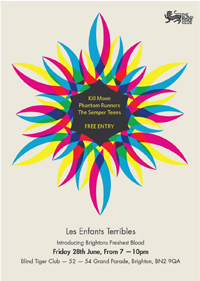 Les Enfants Terribles is at the Blind Tiger, and has Kill moon, Phantom Runners and The Semper Teens on the bill. Brighton Rocks is at Sticky Mikes and sees The Repeat Prescriptions, Midnight Wire, Karlek and Victims Athletic playing. There’s loads of good stuff on Saturday too, starting in the afternoon. 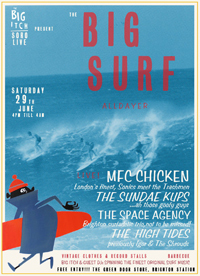 There’s a twelve hour surf rock all dayer on at the Green Door store, kicking off at 4pm and going on until 4am, with The Space Agency playing at some point, as well as loads of DJs and a few other bands from out of town. It’s also The Open House Pub’s Cider Festival, which has Jennifer Left and Jacko Hooper playing live. Finally Champione have their EP launch at a late night gig at Sticky Mike’s from 11pm.